Ten unarmed cult members carried black flags, documents to the national palace. In a bizarre yet non-violent attempt to take control of the Malaysian throne, a group of ten alleged cult members have been detained by authorities. The unarmed group approached the national palace in Kuala Lumpur early Tuesday morning, reportedly dressed “in ninja-style garb” and carrying documents claiming their leader’s royal descent. The cult members – consisting of eight males and two females, including an 11-year-old child – were armed with nothing but black flags and paperwork. 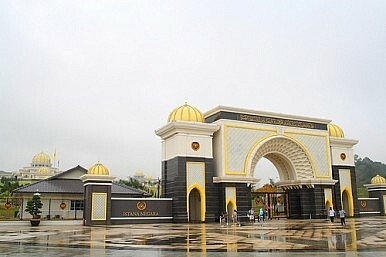 They arrived at Istana Negara in three vehicles, none of which contained weapons. Three of the arrested men lacked identification credentials – the remaining individuals hailed from Malacca, Perak, Kedah, and Johor. The group’s flags bore the message, “There is no god except Allah and Muhammad is His messenger,” written in Jawi. Group members, upon being approached by palace security guards, demanded that government administration be turned over to them. Known as Kumpulan Panji Hitam dari Timur Empayar Langkasuka Nusantara (The Black Banner Group of the Eastern Empire), the cult is being investigated for illegal assembly – as well as for breaking a Malaysian law that forbids challenging royal authority. Disgracing the king is a particularly grave offense, punishable by life imprisonment. “Malaysia has a unique arrangement under which the Muslim Malay sultans of the country’s nine states take turns occupying the national throne as king, rotating every five years. The sultans trace their lineages back to Malay sultanates of the 15th century,” said TimesLive. The Black Banner cult is also thought to be responsible for a similiar stunt in Kedah. Fringe groups have tried unsuccessfully to take over the Malaysian throne in the past. “Any group that claims to be the rightful heir to the throne is threatening the peace and status quo without legitimate rights,” warned Dr. P. Sundramoorthy, an associate professor at Sains University, in an interview with The Star. Is the closing down of homeless shelters in Kuala Lumpur to cleanse the capital’s ‘image’ the last straw for Malaysian citizens? Malaysia Fears Carols?Najib to Nix Controversial LawsMalaysia Rally Turns UglyMalaysia Shows True Colours?Malaysian Pie in the Sky?